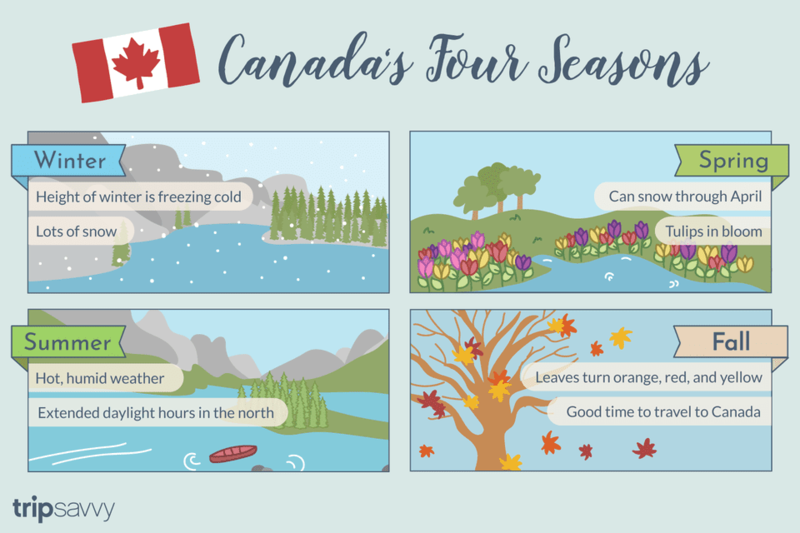 Part of Canada's appeal is its four seasons: winter, spring, summer, and fall. They offer changing landscapes, temperatures, climate, and travel costs. The climate and intensity of these seasons vary across the country. The west coast of British Columbia, including Vancouver, has a moderate climate year-round and thus the seasons are less distinct from one another. Overall, the west coast has summers that aren't as warm nor winters that are as bitterly cold as say, Toronto or Montreal. The farther north you go -- and Canada goes far north -- the colder and heavier the precipitation is. In addition, the proximity to water that many of Canada's most popular destinations have can make temperatures feel cooler or drop more sharply. Winter is generally December, January, and February, though winter weather can start in November and last through late March, early April, especially in the eastern part of the country. The height of winter is freezing cold in most places except for the BC coast, where winters are moderate with little snow. Nearby Whistler, on the other hand, gets loads of snow and is a major ski destination through May. In the Rockies, winter is long. However, snow stays around only in the higher altitudes. Calgary​ does not get much snow, but Banff and Canmore may get two feet in April. In addition, southern Alberta gets winter relief from warm Chinook winds. Eastern Canada, including Toronto and Montreal, has a short, fierce winter, below zero temperatures most of the time, and -20°C (-4°F) not uncommon. At least one or two snowfalls of eight inches or more will likely hit in January and February. Spring comes early on Canada's west coast, with February seeing the arrival of tulips and temperatures on average staying above 0°C (32°F). Elsewhere in the country, spring sticks around through April and extends through to June. But never take this season for granted. You could experience a massive snowstorm in May in Canmore, Alberta. April usually sees the last of the winter's snow, except in higher altitudes like Banff or Whistler, both popular ski destinations where the season doesn't end until May. Summer in Canada is generally June to August with hot, humid weather often arriving earlier and staying later than this in central and eastern Canadian cities like Toronto and Montreal. West coast summers are more moderate, with less humidity and cooler evenings. Canada's northern regions, logically, have cooler summers, but ones that are generally comfortable and sunny. Some northern locales, like Whitehorse, Dawson City, or Edmonton have daylight for between 17 and 20 hours. Where ever you go in Canada during the summer, you are advised to bring a light jacket and some ​rainwear. Fall or autumn in Canada is a wonderful time of the year. In central and eastern Canada, cooler temperatures in September provide relief from the heat and humidity of August and leaves on the trees begin their transformation to stunning shades of orange, red, and yellow. Many people travel to take in this spectacular fall foliage in Canada. Intensity and variety of color are not as pronounced in western provinces, though the yellow larch makes for stunning autumn landscapes. Autumn can be a good time to travel to Canada as high summer prices have subsided but the weather is pleasant and you can still take part in lots of outdoor activities like hiking and camping, whale watching, and more. Vancouver's ubiquitous rain slows down to make September one of the city's least rainy months, making autumn an attractive time to visit this popular Canadian city. What Is Winter Like in Canada?